There is no other way to describe this month’s happening than just total MADNESS! As we gear up for the next coming months of 2014, SM City Marilao brings back the madness of 3 DAY Sale. 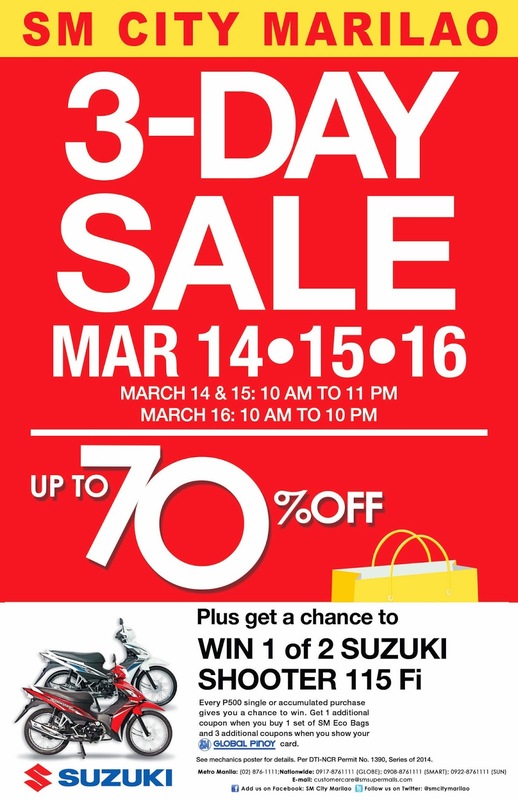 Get ready and mark your calendar on March 14, 15, and 16, 2014 because the 3 DAY SALE MADNESS is set to make your shopping extra amazing and awesome! Bag the bargains as great discounts of up to 70% off shall be applied to countless items mall-wide. Check out the latest summer must-haves from SM Department Store, SM Hypermarket, Ace Hardware, Our Home, Toy Kingdom, Watson’s and SM Appliance Center, and at over 200 stores at the mall. Be mesmerized by the stylish fashion collection at ultra-low prices available at SM Department Store, Bench, Penshoppe, Jewels, Mossimo, Human, Folded & Hung, Get Laud, Shapes, G By Guess, Jag, Oxygen, Plains & Prints, Mossimo, Sabella, People R People, Scoop, Arrow, Karimadon, For Me, Petit Monde, Xquisite and Giordano. Take the years off your age with the tip-top skin regimen promos from Bioessence, Dermclinic, Dermstrata, Dermtrend, Forever Flawless, Let’s Face It, Skin Perfect, Skin Station and Surgilight. Don’t forget to treat yourself to a fab haircut and hair color at Shia Salon, where you can bid dull, dry hair au revoir at a special discount! SM Advantage Card, Prestige Card and BDO Rewards Card holders are also in great luck as there will be an additional 10% off on prices on top of the given discount exclusive from 10:00 AM-12:00NN on March 14 from participating anchor like The SM Store. The madness does not end there because lucky shoppers may win in the 3 Day Sale raffle promo. For a minimum purchase of P500.00, single or accumulated, gives shoppers a chance to win one of two Suzuki shooter 115 Fi during the draw on March 16. Get additional 1 coupon when you buy 1 set of SM Eco Bags and additional 3 coupons when you show your SM Supermalls Global Pinoy Card. So get hold of your receipts and head to the 3 DAY SALE booth. The beginning of a new month could not get us more excited. Bargain hunt only at SM City Marilao on its 3 Day Sale, snag the best deals and bring home loads and loads of goodies for you and your family!